In James L. Brooks' quirky, romantic comedy, three ambitious workaholics are set loose in a network TV newsroom where their professional and personal lives become hopelessly cross-wired. 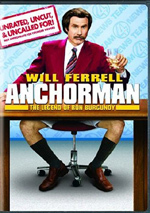 Tom (William Hurt) is the modern anchorman, smooth, handsome and a bit dumb. Jane (Holly Hunter) is his driven, brilliant producer, determined to turn Tom into a real newsman. And Aaron (Albert Brooks) is a seasoned, totally uncharismatic reporter who can't stand Tom's instant success on-camera or with Jane. It all adds up to one explosively funny romantic triangle. $197.542 thousand on 7 screens. Back in 1983, writer/producer/director James L. Brooks scored both box office and Oscar gold with Terms of Endearment. Four years later, he’d return with a follow-up: 1987’s Broadcast News. While not as commercially successful or as big an awards draw, the movie found an audience and continues to be viewed positively more than two decades later. I’d not seen it since the late 80s, so I figured I’d like to take another look at it. TV news producer Jane Craig (Holly Hunter) decries her industry’s move toward fluffy infotainment and bemoans the absence of hard news from network broadcasts. After a disastrous speech on the subject, she finds one fan: local TV anchor Tom Grunick (William Hurt), a handsome dimwit who gets ahead in business solely due to his looks. 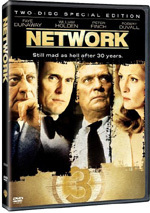 Though she finds herself attracted to Tom, she feels repelled by everything he represents in the “looks over talent” world of TV news – and she ends up stuck with him, as Tom gets a job at her network. As she works with Tom, a relationship slowly builds despite Jane’s reservations – and despite the presence of another potential suitor, best friend/favorite reporter Aaron Altman (Albert Brooks). The film deals with their tangled relationships. Going into this modern screening of News, I maintained a vague memory of it, and I thought I liked it, though obviously I wasn’t bowled over by it. Usually if you love a movie, you remember it very well, while my recollections remained loose. Heck, I forgot that Jack Nicholson plays a small role until he appeared on screen! As I got into the film, I began to realize why I didn’t have stronger impressions of it: while enjoyable and utterly professional, it’s just not a terribly memorable film. Indeed, at times it feels like the whole is less than the sum of its parts; with all the talent at its disposal and a variety of strengths, I feel like I should really enjoy the movie, but I still end up less than enthralled. Perhaps part of my problem stems from my feeling that the film lost steam as it went. It opens with funny prologues that feature the three main characters as kids, and then it digs into the world of network news with gusto. The film tends to work best when it follows the professional side of things; I rather like its “inside baseball” take on big-time TV newscasts. When it follows the personal relationships – which is the topic that dominates the second half of the film – it falls moderately flat. Part of my complaint comes from my impression that it delivers a romantic triangle that isn’t. I was never sure if we were supposed to believe that Aaron had a shot with Jane. I suspect the filmmakers want us to think he could’ve ended up with her, but they invest in this half-heartedly at best. Jane treats Aaron in such a sisterly way that she doesn’t even seem dismissive when he makes his interest known; she barely appears to even acknowledge his feelings for her. Jane doesn’t tend to come across as a particularly complex individual. The movie sets up an intriguing theme given Jane’s strongly offered preference for substance over style. With that idea in place, the film should depict her conflict in the form of her dueling suitors: does she go for super-smart, super-talented but schlubby Aaron, or does she opt for the handsome but intellectually inferior Tom? At no point does the choice ever seem in doubt. This doesn’t mean that she finally settles for either, but it does mean that the film’s basic love triangle is essentially non-existent, and we barely see Jane fight her romantic urges. Oh, she puts up some token resistance to her attraction to Tom, but it doesn’t add up to much. The absence of that character depth causes damage to the film and leaves it more superficial than I’d like. As for our main actors, all got Oscar nominations, but the two men offer the best work. In particular, Hurt offers a deft turn as Tom. Since he usually plays smart, clever characters, it’s unusual to see Hurt as such a dope, but he avoids the pitfalls that might make Tom a cartoon. I like the movie’s choice to make him a nice guy who strives for improvement; it would’ve been easy to create a fatuous narcissist, but instead, we kind of root for Tom because we can see that he’s interested in bettering himself despite his lack of natural intellectual gifts. Brooks’ take on Aaron is more predictable but still quite enjoyable. Brooks basically makes Aaron a riff on the same kind of funny, self-deprecating character he often seems to play; to some degree, I’d guess Brooks just plays himself in these parts. He handles the comedic scenes well, but he also adds a nice touch of sadness and longing to Aaron, so Brooks isn’t a one-trick pony. Unfortunately, I feel less positive about Hunter, who I do think fails to bring much depth to her part. From the childhood prologue on, we see Jane as a picky, Type A sort, and Hunter can’t make her likable. While we’re supposed to see her as spunky, we just view her as annoying. It becomes tough to see why Aaron and Tom are so taken with her, as she often comes across as bossy and irritating. It doesn’t help that the movie acts as a virtual catalog of Bad ‘80s hair and fashions. The coifs prove to be especially galling. I particularly enjoy the big Cinderella moment when Jane dolls herself up for a date with Tom at the Correspondents Dinner. She takes a plain but attractive bob and turns it into Frizz Mania; the world’s worst perm gives Hunter a “stuck her finger in a light socket” look, so just when we’re supposed to be dazzled by her loveliness, we find ourselves bent over with laughter. But I can’t really fault the film for its dated qualities, as those tend to be inevitable. I will criticize it for its lack of willingness to avoid conventional paths and its general slowness. At 132 minutes, the movie overstays its welcome by a good half an hour; with a brisker pace, I think it’d avoid some of its pitfalls. And whose idea was the coda? I won’t reveal what happens in this scene, but it shows us the leads seven years after the movie’s events. Why? It feels utterly pointless, and it would’ve been more interesting to simply let the viewer speculate what happened. Instead, News wraps everything up in a neat bow, and I don’t like that. Don’t get me wrong: this isn’t a bad film, and it’s often perfectly enjoyable. However, its negatives tend to stand out to me more than its positives, perhaps because they create a greater sense of disappointment. With a little tweaking, Broadcast News could’ve been great, so “perfectly enjoyable” makes it a definite letdown. 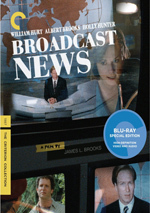 Broadcast News appears in an aspect ratio of approximately 1.85:1 on this single-sided, double-layered DVD; the image has been enhanced for 16X9 televisions. The movie looked decent, but a combination of dated source material and digital artifacts made it less than attractive. Sharpness was one of the many erratic elements. While close-ups and two-shots looked concise, anything wider tended to break up a bit; those scenes could come across as a bit blocky and ill-defined. Overall delineation remained decent to good most of the time, though. I noticed no issues with jaggies or shimmering, but some light edge haloes cropped up at times, and artifacts like mosquito noise became apparent at times. At least source flaws failed to appear, as the movie came with a clean print. Colors tended to be bland, even though the movie went with a natural palette. Much of this stemmed from the general flatness that often affected 1980s film stocks; the tones leaned toward a brown tone that made them unimpressive. A few brighter elements appeared, but the colors usually seemed somewhat drab. Blacks were acceptably deep, but shadows tended to be dense; low-light shots demonstrated a lack of clarity. At no point did the movie look bad, but it rarely looked especially good, either. Still, the image was positive enough for a “B-“ once I factored in the limitations of SD-DVD. While not dazzling, the Dolby Surround 2.0 soundtrack of Broadcast News was pretty good for the film’s genre and era. A chatty flick, the mix offered decent environmental information for a few sequences – street scenes, parties, a war sequence – but these were exceptions to the rule. They did open things up in a moderately positive manner, though, and music boasted nice stereo presence. The surrounds weren’t especially active, but they added to the experience in a satisfactory way. Audio quality was good. Lines appeared fairly natural and lacked edginess or concerns. Music showed good punch, and effects were fine. They didn’t have much to do, so they never taxed the speakers, but they demonstrated fine clarity. Though the mix never excelled, it was positive enough for a “B-“. How did the picture and sound of this 2010 Criterion release compare with those of the old DVD from 1999? Both areas demonstrated improvements. The audio seemed clearer and demonstrated a more active soundscape. In terms of visuals, the 2010 disc was cleaner and tighter. The limitations of the source meant that the 2010 DVD wasn’t a killer step up, but it definitely looked and sounded better than its 1999 predecessor. At least the 2010 Criterion release improves on the 1999 DVD’s extras. Both include the film’s trailer, but everything else is exclusive to the Criterion version. Disc One provides an audio commentary from director James L. Brooks and editor Richard Marks. Both sit together for this running, screen-specific look at the movie’s origins/influences and development, story and character notes, cast and performances, sets and locations, music and editing, research, and a few other areas. For its first 45 minutes or so, we find a terrific commentary. After that? Not so much. Brooks dominates the whole thing and has quite a lot to say for the movie’s first third or so, but after that, he peters out to a moderate degree. Oh, he still gives us a reasonable amount of info, but gaps become more prominent and praise more frequent. Overall, the commentary’s worthwhile, but it’s not a consistent pleasure. Over on Disc Two, the main component comes from a documentary titled James L. Brooks – A Singular Voice. It runs 36 minutes, 24 seconds and includes notes from composer Hans Zimmer, writer/producer Al Jean, critic Ken Tucker, ICM chairman/CEO Jeffrey Berg, filmmaker Wes Anderson and actors Marilu Henner and Julie Kavner. We hear about Brooks’ career in TV and movies as well as themes that pervade his work. “Voice” acts more to appreciate Brooks than to discuss his work. We get a smattering of minor insights here, and it’s nice to see a recap of his career, but I don’t think we learn a whole lot. As a general overview, it’s enjoyable, but it doesn’t deliver much depth. Next comes an Alternate Ending and Deleted Scenes. The former fills 10 minutes, two seconds (including Brooks introduction), while the latter go for a total of 19 minutes, 25 seconds. We get 15 cut sequences, and they throw in some unused or neglected characters. The main addition comes from a gay government employee with a crush on Tom; this allows the TV reporter to get scoops that boost his career. In addition, we see more of the Tom/Jennifer relationship, longer scenes between Tom and Aaron, producer Ernie and his wife, and a longer confrontation between Tom and Jane at the airport. All of these are at least moderately interesting, but they were good cuts. The movie’s already too long, so the extra beats would’ve done more harm than good. As for the alternate ending, it would finish the movie on a more traditional note. Brooks indicates that he received a ton of criticism for the flick’s finale, but I don’t have a problem with it; I just don’t like the coda. It’s unclear if the coda still would exist if Brooks used this ending, but I don’t care for it. We can watch the 19:25 of deleted scenes with or without commentary from Brooks. He tells us a bit about the clips and why they got cut. Well, he says that some of the time; Brooks’ commentary tends to be spotty, so don’t expect consistent coverage. We get a few nice notes but not a ton. Disc Two ends with two featurettes. Susan Zirinsky goes for 17 minutes and offers notes from Zirinsky, a veteran TV news producer and one of the inspirations for the movie’s Jane Craig role. Zirinisky discusses her career and involvement in the film. She’s blunt and funny as she provides a terrific look at the person behind the character. We wrap up with the simply titled Featurette. It splits into two areas: a 1987 piece produced by Fox (7:55) and additional interviewa and on-set footage (18:38). Across these, we hear from Brooks and actors Albert Brooks and Holly Hunter. Both in the puffy featurette and the collection of outtakes, the interview bits don’t tell us much; we get a few general observations but nothing particularly memorable. The behind the scenes footage is better but also fails to become especially terrific. Like all Criterion releases, this one comes with a booklet. In this 16-page piece, we find an essay from film critic Carrie Rickey as well as some credits and photos. It’s skimpier than many Criterion booklets, but it still has some good qualities that make it a nice capper to the set. With two Oscar-winning lead actors, an Oscar-winning director, many other talented folk at its disposal and a great theme, Broadcast News should’ve ended up as a classic. Instead, it gives us something pretty good and that’s it; the movie certainly has its merits, but it comes with too many flaws to be special. The DVD provides acceptable picture and audio as well as a generally good set of supplements. I can’t say I’m wild about the film itself, but this turns into its best DVD incarnation.